Looking for a clean, well-cared for 2012 Subaru Impreza Sedan WRX? This is it. When you purchase a vehicle with the CARFAX Buyback Guarantee, you're getting what you paid for. All-wheel drive means peace of mind all the time. This Wr Blue Pearl AWD Subaru enjoys a host offeatures, including exceptional acceleration and superior stability so you can drive with confidence. One of the best things about this Subaru Impreza Sedan WRX is that it has low, low mileage. It's ready for you to truly break it in. Added comfort with contemporary style is the leather interior to heighten the quality and craftsmanship for the Subaru Impreza Sedan WRX Pre-owned doesn't have to mean "used." The clean interior of this Subaru Impreza Sedan WRX makes it one of the nicest you'll find. Buying a pre-owned vehicle shouldn't mean buying a vehicle with scratches, blemishes, and paint touch-ups. 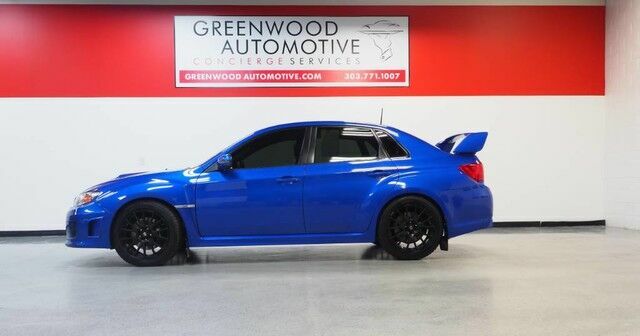 Fortunately, the paint on this 2012 Subaru Impreza Sedan WRX WRX STI is as flawless as a new vehicle. More information about the 2012 Subaru Impreza Sedan WRX: The 2012 Subaru Impreza remains a great buy in the mid-size segment, thanks in large part to its standard all-wheel-drive, great safety rating, and availability as either a sedan or 5-door wagon. The focus has shifted to fuel economy, and the new 2.0L boxer engine returns impressive figures, including 27 mpg city and 36 mpg highway when equipped with Subaru's all-new continuously variable transmission (CVT). Subaru estimates that Imprezas with the CVT will be the most fuel-efficient all-wheel drive cars available. Base price or the new Impreza starts at $17,495. Power junkies can get their fix too, as the WRX and WRX STi models offer impressive performance in a small, affordable package based on the previous Impreza bodystyle. Strengths of this model include great safety features, available wagon versatility, Standard all-wheel-drive, and impressive performance from WRX models WWW.GREENWOODAUTOMOTIVE.COM for all Photos Our Dealer Handling fee of $499 is included in our advertised price. Government fee's and licensing are additional costs. For best service and to check availability or to set an appointment to see and drive call Steve direct at 720-339-1516 or Marc at 303-552-7909 For more information. FINANCING AVAILABLE. TRADES WELCOME. *VEHICLE IS FULLY INSPECTED BY OUR MECHANIC. We are located 4 Blocks West of I-25 on North side Of Arapahoe, Behind US Bank at Syracuse St.